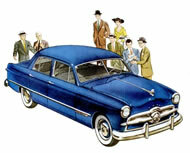 I have had my 1950 Ford Tudor sedan for 43 years! 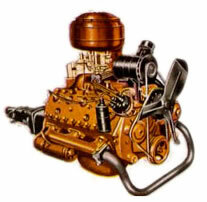 It is a street rod with a built 327 chevy, Muncie m-21 four speed, and a 9 in. Ford diff. with 4:11 gears. When I found it in a junk yard, my father who owned a muffler shop traded a muffler job for it. It has the original rechromed grill, bumpers, hood ornament, and Ford emblem. The 50 has such great styling I thought it would only detract from its looks to alter it. I did radius the fender wells, but kept the side molding which extend from the stock location in the front to the beginning of the rear fender wells. I rearched the back springs and put larger coils in the front to create about a 6 inch lift all the way around. It has BF Goodrich Radials and slotted mags. Shoeboxes rule!